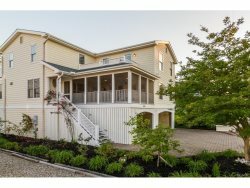 5 Bedroom, 4 bath Single Family home- 1.25 blocks from the beach. Central Air, Outside Shower, TV's, Washer/Dryer, Micro, Telephone, Ceiling Fans, Deck off the back, BBQ. Home is situated in the middle of 2 lots, offering an unusual large back yard - walking distance to downtown shops , restaurants and the Boardwalk. Come and enjoy the beach and the sun at Bethany Beach. No pets and Non smoking.